Opening hours: Daily 24hrs. 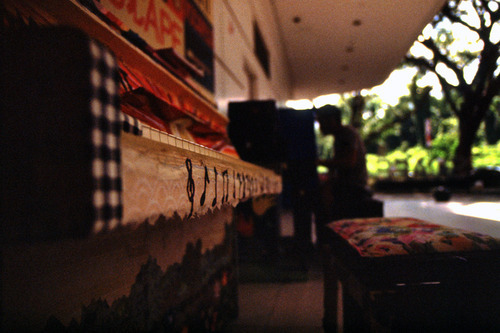 There are two duelling pianos at this location, one is decorated by Singapore Council of Women’s Organisations – Star Shelter with Wilma Limmen and the other by CARE Singapore with Melissa Tan. Trying out for the first time with Dorothy Chia the most delightful and charming duet for harp-piano by Dussek Op. 38. Dorothy played the harp part (seated behind) while I did the piano part. Some piano teachers gathered at Scape to jam and play duets on the 2 pianos. Hope you enjoy our playing. 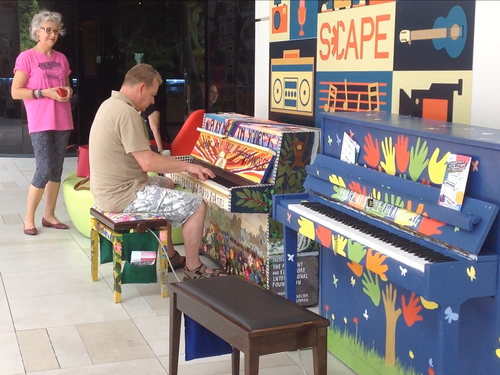 Very colorful - but this afternoon lonesome - dueling pianos at SCAPE. Great to meet Wilma, creator of the piano on the left. Outside, so challenging to any player, but both very nice pianos to play! To all of the locals, more used to the circumstances, hope you'll find a moment to get out there and inspire a player to your left/right... Have fun and spend a moment on the good causes that made those 2 pianos possible! Having some fun in a unusual improvisation of piano + beatbox! 2 pianists play tentatively together for the first time. 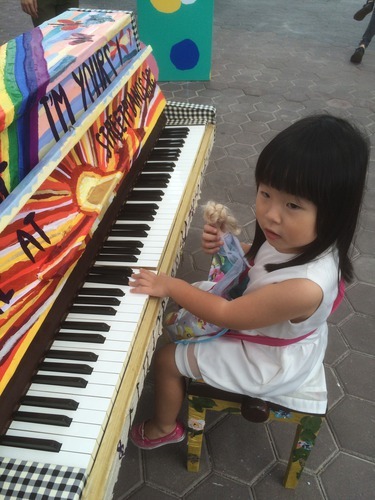 We were so proud to see "our" piano at the launch on 13 March on OCBC Square! Thanks to SCWO Star Shelter and a great team of assistants and residents this beauty of a piano came to life under my guidance. 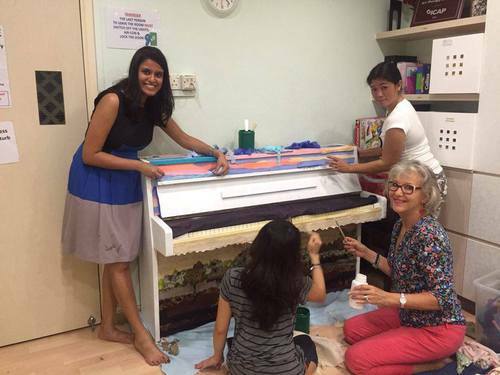 Come and learn more about painting with fabric and visit/play the piano at SCAPE! It's Daddy Daughter Date Day! So here is my daughter playing music with her Favourite character Elsa. 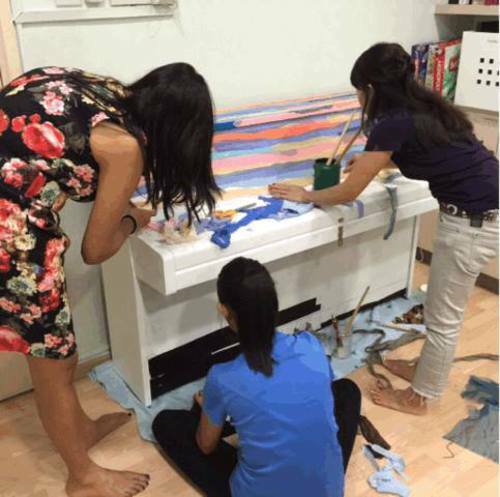 Volunteers from Singapore Council of Women's Organisations (SCWO) prepping their piano! They're doing fabric painting with Wilma Limmen. A truly one of a kind piano! Just look at the colours. Gotta love it. Thank you to Gramercy Music for the donation of the piano! Ladies from Singapore Council of Women's Organisations (SCWO) prepping their piano! They're doing fabric painting with Wilma Limmen. A truly one of a kind piano! Just look at the colours. Gotta love it. 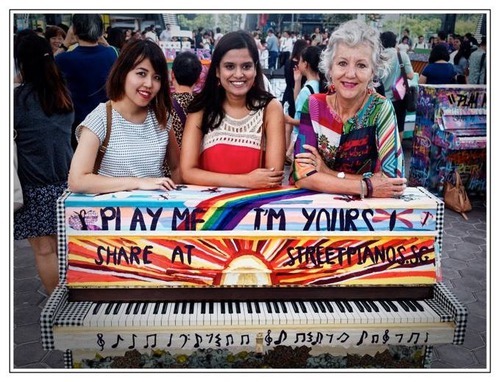 #streetpianossg #playmeimyours #fabricpainting #fabricart — with Singapore Council of Women's Organisations (SCWO).